Last night, DOT presented a plan to the Manhattan Community Board 9 transportation committee that would bring pedestrian safety improvements and a road diet to Riverside Drive, but DOT is proposing no bike lanes for the popular cycling route [PDF]. The plan for Riverside Drive stretches from 116th to 135th Streets, which ranks in the top third of high-crash Manhattan corridors and was the site of 20 serious injuries from 2008 to 2012. Of those injuries, 19 were motor vehicle occupants and one was a pedestrian. The average midday speed on the Riverside Drive viaduct in West Harlem is 36.5 miles per hour, according to DOT, with 75 percent of all drivers exceeding the street’s current 30 mph limit. Council Members Mark Levine and Helen Rosenthal asked DOT last month to lower the speed limit on Riverside to the new citywide default of 25 mph [PDF]. The agency said last night that the speed limit on all of Riverside Drive will soon drop to 25 mph, with signals retimed to match the change. The project also includes two blocks of 116th and 120th Streets between Riverside and Broadway. East of Broadway, 120th Street is already one lane in each direction and 116th Street is a pedestrian walkway on the Columbia University campus. 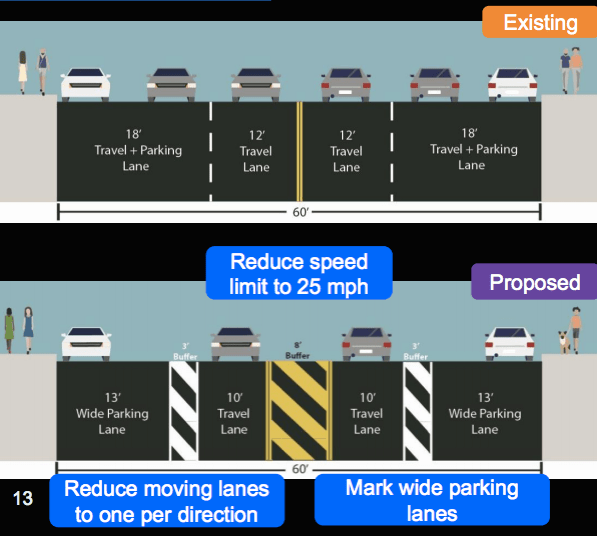 Due to low traffic volumes, those two east-west streets will receive road diets, dropping them from two lanes in each direction to three, including a center turning lane with pedestrian safety islands. The road diet includes an extra-wide parking lane to provide breathing room for cyclists, but no bike lanes. On 120th, four refuge islands would be installed — one each at Riverside and Broadway, plus two at Claremont Avenue — while on 116th, just two refuge islands would be installed at Riverside and Broadway, with none at Claremont to accommodate trucks that would be unable to turn around them. An audience member suggested closing the curved “slip lane” from Claremont Avenue to 116th Street, but DOT said that roadwork would exceed the project’s budget. Instead, the department is proposing adding a sidewalk and parking to the eastern side of the triangle at 116th and Claremont. Parking would also be added to the southern side, though some residents worried it might impact visibility for drivers going from Claremont to 116th. The plan as currently designed results in a net gain of six parking spaces, but some community board members wanted more. “We need to be finding extra spaces to take care of people who are not well enough off to have a garage and the luxury of a garage,” said CB 9 member Ted Kovaleff, who asked that DOT add angled parking to 116th and 120th Streets to squeeze in more cars. DOT project manager Dan Wagner explained that adding diagonal parking would mean there wouldn’t be space for pedestrian islands. “Do you prefer more parking or do you prefer pedestrian safety? I think that’s the debate,” Wagner said. “You’ve missed an incredible opportunity with the viaduct,” CB 9 member Brad Taylor told Wagner. “I’m wondering why we need to give up that space in the middle, because this is an extension of Riverside Park. This could be our High Line. There are beautiful views along the river.” Wagner didn’t entertain the idea of replacing the striped buffers with a plaza-like pedestrian space overlooking the river, saying that it would be beyond the scope of this project. South of the viaduct, the plan includes changes to the loop around the General Grant National Memorial. Sidewalks will be added and extended along the triangles at the southern and northern ends of the loop, as well as to the triangle immediately east to the memorial where Riverside splits at Sakura Park. Crosswalks will also be added, though DOT hasn’t yet committed to crosswalks at the northern end of the loop because there are no stop signs or traffic signals there. Wagner said DOT’s signals division is looking at “creative” solutions. 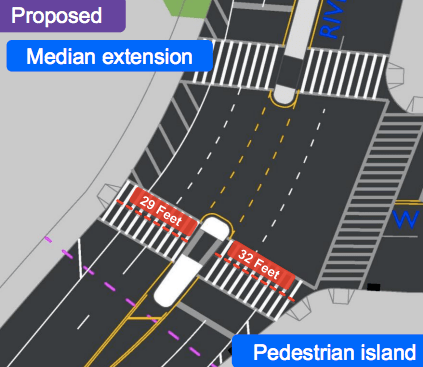 DOT is also proposing to add traffic islands and extend medians on Riverside Drive at 120th and 135th Streets to reduce crossing distances for pedestrians. A resident last night asked DOT to close a gap in the Riverside median between 116th and 119th Streets that drivers use to make illegal U-turns, and agency staff seemed receptive to including it in the project. CB 9 chair Rev. Georgiette Morgan-Thomas said the board will consider a resolution on the plan next month. Those benches and cobbles on Riverside Drive are used by longtime residents in summer to play domino, hang out and yes bbq…it’s one of the few pleasures the locals have in the Spring Summer..please don’t suggest taking this away from longtime residents who’ve toughed it out in this area since the crack ridden eighties and way earlier…people who remember that park on Columbia side of the viaduct when it was needle park… The walk on Riverside Drive going from 135 northwards doesn’t need to be spoiled with bike lanes. We need idiots who speed over that viaduct, often swinging right onto 135th, without yielding to pedestrians to be stopped immediately I’ve lost count if the amount of near misses I’ve seen on that corner. The Grayline bus drivers and MTA buses can be some of the worst offenders. I can’t stand hearing opinions from “Columbia staff who don’t earn much” who live in NJ, about what should be done in West Harlem.. f outta here.